Union leaders have agreed to end the crippling Tube strike which caused misery for commuters in London. Officials accepted an offer, after peace talks with management, that has ended the current stoppage, which had been planned to last 72 hours. Millions were left facing chaos after 2,300 Rail, Maritime and Transport (RMT) members walked out on Monday. Although the strike has been suspended, commuters were warned there will still be delays on Wednesday morning. Transport for London (TfL) said it had clarified assurances on jobs and pensions during nine hours of talks, which broke up at about 2300 BST on Tuesday. The union said it was waiting for the outcome of a meeting with pension trustees on Wednesday but the strike would be suspended. Union officials will meet again on Friday before deciding whether to press ahead with a second 72-hour strike next Monday. A spokesman for TfL said: "We are pleased the RMT has suspended its strike action at Metronet following the clarification of all jobs and pensions issues. 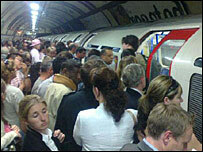 "We will now work to provide the best possible Tube service on Wednesday. "However as the strike was suspended so late this evening it will take time for us to restore a full service on all Underground lines tomorrow (Wednesday). "Passengers should check before they travel to see how Tube services are running. "Our staff will be available to provide travel advice and assistance on Wednesday." 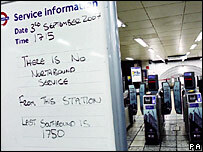 The strike, sparked in the wake of the collapse of maintenance firm Metronet, had closed two-thirds of the Tube network and affected 10 lines. Prime Minister Gordon Brown described the walkout as "wholly unjustifiable". The union launched the strike amid fears jobs could be lost and pensions affected by Metronet's collapse. Nine lines were shut by the walkout, which began at 1800 BST on Monday. They are the Bakerloo, Central, Victoria, Circle, District, East London, Hammersmith & City, Metropolitan, and Waterloo & City. The Piccadilly line has been suspended between Rayners Lane and Uxbridge. They are maintained by another firm along with the Piccadilly line.